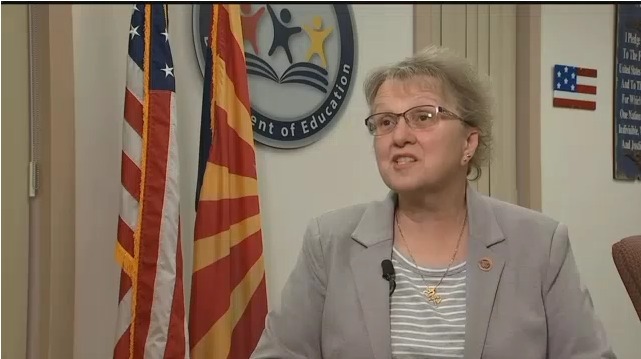 If teachers walk off the job on Thursday, April 26, Arizona Superintendent of Public Instruction Diane Douglas warned that “there may be investigations” if complaints come into the Department of Education. Furthermore, if the courts deem the walkout a “strike,” Douglas cautioned that teacher certifications may be revoked and censure notices placed on an instructor’s permanent record. However, Douglas urged teachers not to walk out on Thursday and suggested that they continue negotiations with the Governor and legislature, especially because there are proposals to bargain over. Furthermore, she pointed out that students with free and reduced lunch and special needs may suffer if a walkout occurs. Finally, Douglas intimated that instructors may themselves be blacklisted, have their certificates revoked, or be ostracized from future employment if complaints from the community to the department were processed. That portion of the interview with Superintendent Douglas threatening potential reprisals against instructors shows an attitude that this country has not seen publicly since the McCarthy Era when many were blacklisted for their real or imagined beliefs. That attitude should not be ingrained in the public servants of our state or country in the year 2018. Fortunately, there are two Progressive Democrats (Kathy Hoffman and David Schapira) just waiting for a chance, after one of them earns their party’s nomination, to replace her after the November elections. Teachers do not want to walk out. Teachers want to educate and shape children’s hearts and minds. However, they cannot do it effectively when their salaries rank near the bottom of the country. They cannot do it passionately when they sometimes have to work a second job to put food on their table. They cannot do it competently when they are not provided the modern resources to do the job well. This is about what is right for the children. It is a step in the right direction to make sure that the people who are responsible for them eight hours a day or longer are properly provided for. Making sure our schools are safe and provide all the features of Twenty-First Century culture and technology is another. The Superintendent and Governor are not going to get there by making idle threats or catering to the conservative whims of their alt right-reactionary sponsors who feel the McCarthy Era was “The Good Ole Days.” It is time to properly fund our schools, compensate our instructors and support staff, and prepare our children for tomorrow. Douglas again showing that she is an uneducated twit when it comes to education. Say you fire 40,000 teachers….where do you think you will find 42,000 qualified teachers to work in Arizona…or did you forget that you have 2,000 openings right now? Ms. Douglas shows just how little she knows about education and teaching. She should champion the causes of the educators and children instead of “Trumping” them out of the profession. Threatening teachers with revoking their licenses is like throwing fuel on a fire. It’s a scare tactic that’s not intelligent at all. Of course, the message was handed down to her from Governor Ducey. 1) The proposed raise is for teachers only spread out over three years. How can he guarantee any of that when there’s an election this November? He can’t. 2) As mentioned, the recommended proposal for a raise is for certified teachers only. That leaves out raises for classified staff (bus drivers, cafeteria workers, custodians, etc. ), paraprofessionals, classroom aides, etc. The teachers refuse to agree to any deal that excludes those groups. 3) There is no money offered to raise per pupil spending. AZ is approximately $4,000 below the national average in per pupil spending. We aren’t leaving the students behind, either. 4) Governor Ducey hasn’t provided anything close to addressing the revenue required to meet the teacher salary increases let alone the rest of the aforementioned personnel. He has hinted that the money may be pulled from other social service branches of the government. That’s referred to as robbing Peter to pay Paul. 5) Many schools are in terrible physical condition and many students are using teaching materials created long before they were born. In sum, the governor’s proposal doesn’t begin to address the entire issue and he can’t guarantee anything. His unwillingness to divulge the source of revenue to pay for his plan should send up red flags everywhere. Well said. You can see the GOP con in your first point. They say it’s a 20% raise over three years, but it has to be voted on multiple times, giving the GOP a way to worm their way out later while pretending to support teachers and an educated citizenship. It’s Three-card Monte, the usual GOP con. Hey, GOP voters, if you don’t see the con, you’re the mark. Do us all a favor, resign Diane.